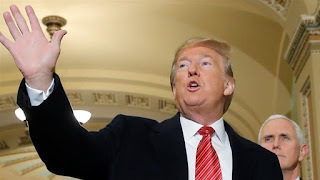 US President Donald Trump on Thursday canceled his planned trip later this month to attend the World Economic Forum in Davos, Switzerland, In respect to the ongoing partial shutdown of the US government. The announcement came in a Tweet in which he blamed Democrats for the shutdown, which began on December 22 after Trump, his fellow Republicans and Democrats failed to come to agreement on whether to allocate the more than $5bn in funding the president demanded for a wall on the US-Mexico border. Democrats, who blame Trump for the shutdown, oppose the wall, calling it ineffective, immoral and expensive. They have instead agreed to allocating more than $1.3bn in funding for broader border security measures that do not include a wall. Ahead of a trip to the border in Texas, Trump on Thursday renewed his threat to declare a national emergency to circumvent Congress if a deal cannot be reached. If he acts on the threat, it will likely be challenged in the courts. Earlier in the day, Trump said he wanted to got to the annual Davos event, which is scheduled for January 22-25, but would skip the meeting if the shutdown persisted. He then made the announcement he was cancelling his trip to Switzerland in a tweet. Treasury Secretary Steven Mnuchin and other Cabinet members are still scheduled to attend the economic forum, which attracts business and political elite. China’s Vice President Wang Qishan is also expected to attend, but it is not clear if there are any arrangements for a meeting between him and US officials during the annual gathering. China and the United States have taken a 90-day pause in implementing tariffs to hammer out a trade deal. The Swiss meeting could also provide US officials with opportunities to discuss better terms of trade with the European Union, Japan, Canada and Mexico. The US partial government shutdown, now on its 20th day, affects some 800,000 federal workers who have been furloughed or required to work without pay.